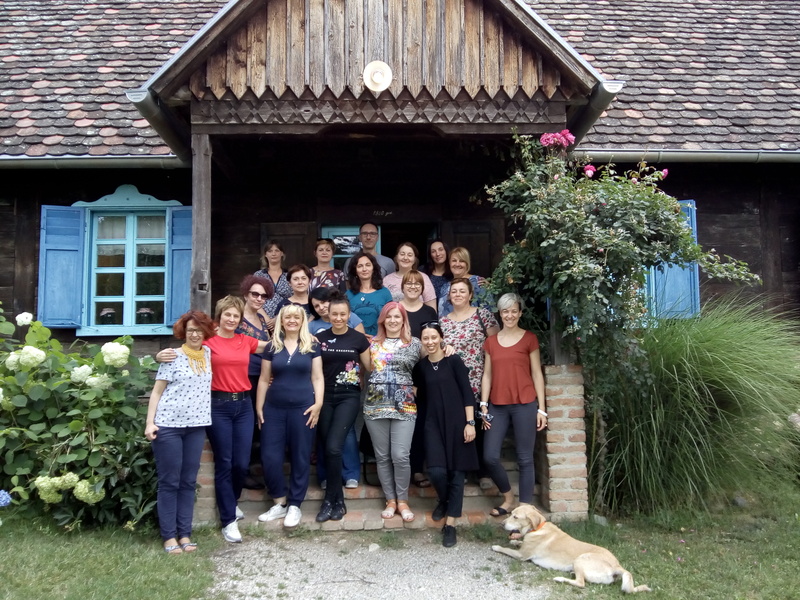 A Cirle of Friends training took place near Zagreb this summer as Open Academy Step by Step invited 20 participants to share their knowledge on this highly effective approach. Circle of Friends is one of several ‘person-centered’ planning tools, initially developed to promote inclusion of pupils with disabilities in mainstream schools. Trainers Vesna and Olga from CIP-Centre from Serbia proved the success of this approach by sharing their experience in moderating and facilitating the methodology with pupils in Serbia. The Peer Learning Activity based on those experiences was attended by staff members, trainers and mentors, and other (pre)school teachers. Also present were pedagogues and psychologists, among whom were educators working with migrant and Roma children. Circle of Friends is an approach aimed at enhancing inclusion of any child or young person who is experiencing difficulties in school. Inclusion may need promotion because of disability, a personal crisis or because of challenging behavior towards others. The Circle of friends approach works by mobilizing the young person’s peers to provide support and engage in problem solving with the person in difficulty. Because being included in the academic dimension is not enough. For proper inclusion, children and young people need social and cultural activities with their peers: during school trips, during lunch time and in similar situations. According to the two trainer’s experience - a major advantage of the approach – is that it does not involve major commitment of the teaching staff. This is because the real work is done by peers themselves, and not the adults. The adults’ role is to facilitate children’s social learning, altruistic behavior, and to help them in creating a supportive peer community. This is at the same time the most important and most challenging aspect of the presented methodology. Educators and teachers have to trust children, provide children with confidence and power and create an opportunity for their participation and not force social contacts or friendships. The adults’ role is to meet with the circle for around 20-30 minutes weekly to facilitate their problem solving in the early stages. The trainers used the opportunity of that meeting to discuss possible ways of adjusting the approach and necessary adaptations for working with pre-school children or migrant and Roma children. They also made plans for future implementation of this methodology in schools and kindergartens in Croatia and emphasized the role of the Step by Step team in supporting and supervising this process. More information on Open Academy Step by Step Croatia is to be found here.